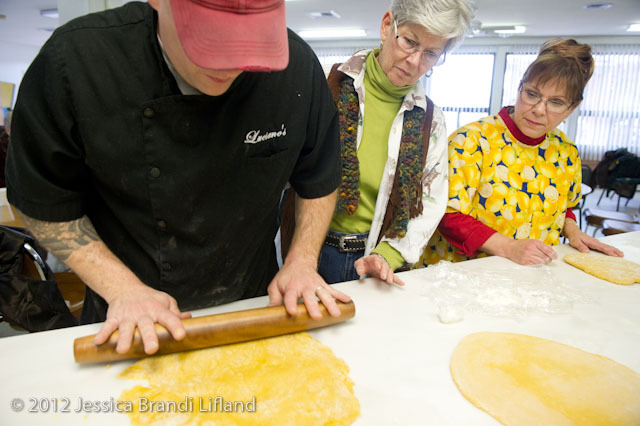 Yesterday, at the National Cowboy Poetry Gathering, Luc Gerber of Luciano's restaurant in Elko taught about 15 men and women the secrets of ravioli-making from start to finish. The dough: flour flew as the group went about mixing and rolling the dough. Then it was left to set. A layer of flour thicker than the current snowfall in Elko settled on everyone in the kitchen. Meanwhile the group created two types of fillings—a crab filling and a sausage and mushroom filling—both with a ricotta cheese base. Garlic was smashed and herbs chopped and added to their respective bowls. The Sauce: tomatoes were cut and basil chopped. More garlic was smashed. The group cooked up two sauces, one from fresh tomatoes and one from canned stewed whole tomatoes. The assemblage: the real fun of putting together the ravioli was assembling the parts. More flour flew, but alas, the group was short of rolling pins. In fact there was only one. So they improvised, rolling with bottles of 7-up, hot sauce, beer and even an empty carafe. They each took a turn on the pasta maker, which presses the dough thin through a cranking system much like an old-fashioned bed sheet press. Scoops of filling were spooned onto the rolled dough. Some had more success topping off, sealing and cutting the raviolis than others. The boil: fresh pasta does not need to boil for very long. About 3 minutes after the pasta hits the water, it floats to the top, ready to eat. But not quite...first it needs some tomato sauce. The salad: the meal was rounded off with a caesar salad made with romaine lettuce and a dressing consisting of ingredients such as olive oil, mayonnaise, garlic, vinegar, some artichoke hearts and seasoning. The meal: gulp...not a single boiled ravioli left uneaten.